that wowed the fans with his bag of tricks and exquisite passes. bar from the penalty spot as keeper Vincent Enyeama stood motionless. Joel Obi, took the lead in the 5th minute through Emenike. admiration of Port Harcourt fans. past Oboabona and Shittu before rounding off Enyeama to make score 2-2. Fans were stupified as Enyeama pursued Eto’o around the pitch. The Lille man caught him and then celebrated the goal with him. Dele Ayenugba in goal for Team World and put his side ahead 3-2. Okocha then set up Musa on the left wing and the CSKA Moscow man passed to Emeike to shoot home. and continued his dazzling displays. Captain Yobo reduced the score by stroking home Eto’o’s pass inside the box. 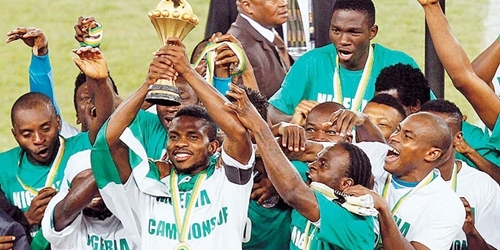 After the break, Yobo captained the Eagles and should have scored but his penalty was saved by Ayenugba. He however made amends a few minutes later to put the Eagles up 5-3. Actor, Osita Iheme, reduced the tally for Team World but it was too little too late as Yobo ended his final game a winner.